A range of oxide paints used for all structural steel surfaces, farm buildings, hay barns, sheds, corrugated iron roofs and other metal structures. With an extremely advanced durability, the lead free SYN-OXIDE paint acts as an outstanding weather shield, offering protection against external factors, and at the same time enhances the appearance of the farmyard. 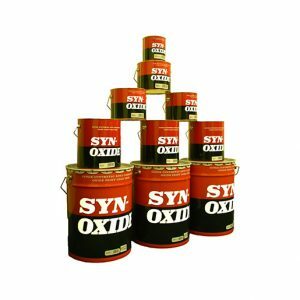 SYN-OXIDE is an easy-to-apply paint, needs minimum preparation, and assures effective results. Fresh galvanised corrugated iron, should be allowed to weather for approx. 12 month. When exposed over this period of time, oxide salts and contaminants from the atmosphere will form on the surface. No painting should be undertaken until this is removed, using a stiff bristle brush and plenty of clean water.